They say that everything old is new again. That's definitely true when it comes to saving garden seeds. For generations, our ancestors collected and stored the seeds from each year's harvest to use for the following season's planting. Now, most people who decide to plant a garden start with a trip to the garden store to buy packets of seeds to plant. Or to load up their carts with seedlings for a head-start on the growing season. And there's nothing wrong with either choice. But with prices rising and incomes remaining stagnant (or even falling), there's a renewed interest in saving garden seeds from one year to grown new plants the next. If you're considering harvesting, saving and replanting seeds from your vegetable garden and other plants, here are the facts you need to know to do it the right way. If you're considering gathering seeds from food or plants you've bought at the local grocery store or garden center, think again. There are many reasons to use hybrid seeds for vegetables, flowers and herbs including preferred taste, resistance to disease, pests, and longer safe storage. But gathering seeds isn't one of them. Most seeds from hybrid plants are sterile, so no matter how carefully you save or plant them, you won't grow a new crop. Other hybrid offspring produce odd results, and may not look or taste like their parent plants at all. To harvest seeds, you need plants started from heirloom seeds, or pure strains of plants. If you're not sure if a plant you have is a hybrid, check with your local garden center or garden club,. They might be able to help you identify which are heirloom plants and can be used for seed gathering. Make sure the plants you use for seed harvest are strong and healthy. Susceptibility to disease, and even to insect attach can be genetic. No plant is completely immune to disease or bugs (not even hybrids), but the parent plants you choose should be strong and productive. Seeds are ready to harvest when the plant is fully ripe. But in this case, ripe seldom means ready to eat (or display, in the case of flowers.) The seeds usually ripen when the fruit, veggies or flowers are past their prime for our use. Let herbs and flowers "go to seed", let fruits and veggies over-ripen, and ideally fall off the plants before you start the collection process. Dry seeds such as those from herbs, flowers, peas, beans and onions should be allowed to dry as long as possible on the plants. If your area has a lot of rain, a simple sheet of rigid plastic or thin wood suspended over the plants can allow the seeds a longer time to ripen and dry on the plant. Once you collect the seed pods, beans or other heads, spread them on fine screen to complete the drying process. Very tiny seeds can be dried and collected in paper bags suspended from the ceiling in a warm, dry room. Spread the washed seeds on a screen to dry.Old window screens work well and are usually cheap at thrift stores -- just make sure the screen is clean and dry before you use it. Cover the seeds with a second screen to keep insects away. Allow the seeds to dry for 3-7 days depending on the humidity where you live. Once the seeds are dry, pull, pick or brush away any remaining pulp or skin. Popular wisdom says that freezing seeds before storing will kill diseases and any insect eggs. While this might be true, there is also evidence that rapid freezing and thawing (when you remove them from the freezer might rupture cell membranes. My thought? I worked with the Landis Valley Heirloom Seed project for several years, preparing seeds for storage and packaging. We never froze a seed, and had an excellent propagation rate. So I side with the no-freeze camp. But the choice is yours. Once your seeds are completely dried and cleaned, it's time to package them. I use glass canning jars for my seeds, but you can make paper packets (acid-free scrapbook paper works well), archival-safe envelopes, small metal boxes or even plastic kitchen storage containers. Make sure you label your storage choice with the plant type, and the year packaged as well as any notes about the plant's growth. Keep your harvested seeds in a cool, dry place. Avoid rooms that get very hot, like the area near a furnace or water heater. Cellars, the bottom shelf of your pantry or a shelf in a hall closet are all common choices. If your seeds are stored in glass, place them far back in the shelf or wrap the jars in paper to keep them dark. 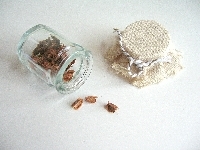 Most seeds will last very well for three years, if properly dried and stored. Some have lasted for decades. Check with your local country extension department if you have questions about a certain type of seed.